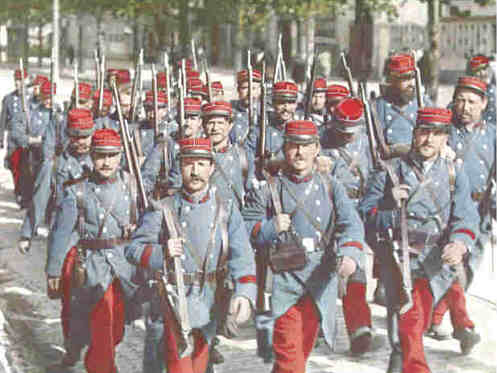 French soldiers, referred to as "Poilus" (hairies), went to war wearing a near suicidal costume for the modern battlefield. 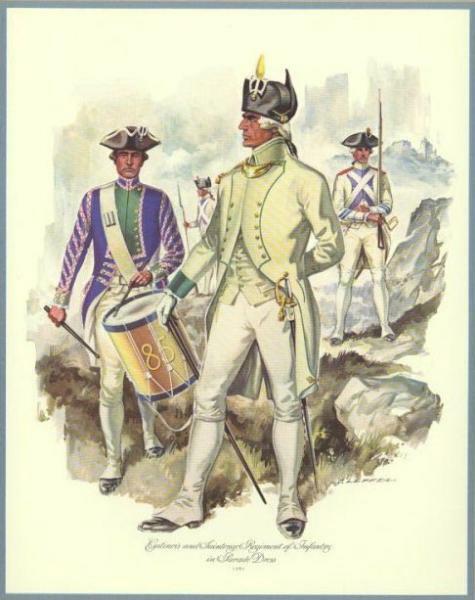 This uniform was made up of bright red trousers and a blue double-breasted overcoat complete with shiny brass buttons and tails! A smart rakish kepi (think of the US civil war) was worn instead of a helmet. French cavalry wore the same obsolete design of shining brass accented polished breastplates with matching plumed helmets that napoleons cavalry wore at waterloo 99 years before. These exotic uniforms even paled in comparison to those of the colonial units drawn from Africa. In 1915 a more sedate uniform and helmet was issued after the flower of the army had been lost along the Marne and the Anise. 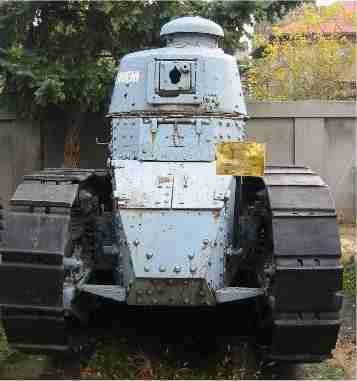 The Achilles heel of the world war one French army was in the poor nature of its armaments. 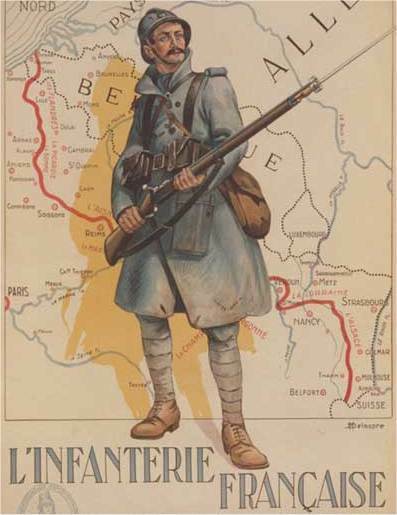 The standard infantry rifle, the 8mm 1893 Lebel rifle was inaccurate and its wartime replacement, the 1915 Berthier was slow to take the field. French machineguns including the 1907 St Etienne, 1909 Hotchkiss, and the Chauchat light machine gun were held in such poor light due to mechanical unreliability that the government had problems even giving them away after the war. Heavy artillery was lacking in numbers but the excellent 75mm light gun helped to alleviate this fact. 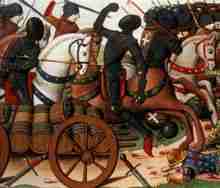 Battles fought by the French worldwide ¿ from Haiti and Mexico to Siam, Egypt, and China!! 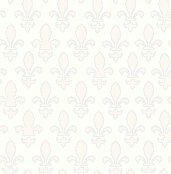 Le nom, "Fracta Vallis" au Xème siècle, traduit la présence de l'éperon barré commandant un coude de la rivière (site du château). Occupation préhistorique et gallo-romaine. Ancienne ville fortifiée. Le donjon du château, construit fin XIème siècle ou début XIIème siècle par le comte de Blois, marquait un point stratégique entre le Blésois et leurs possessions de Châteaudun et Chartres ; il fut ruiné pendant la guerre de Cent Ans. Fréteval fut le théâtre d'une bataille en 1194 où Philippe Auguste fut défait par Richard Coeur de Lion. Between the forces of the Roman Emperor Julian the Apostate and the Alamanni led by King Chnodomar. 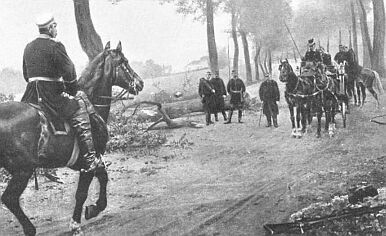 As the battle commenced, the German infantry, anxious not to be abandoned, convinced the cavalry to dismount and fight on foot. Despite this disadvantage, the Alamanni succeeded in driving back the Roman cavalry. Additionally, the Alamanni infantry, led by a band of nobles, broke through the Roman center. However, Julian rallied his cavalry, which returned to the fight, and the Roman Primani legion plugged the gap in the Roman center. The Alamanni soon broke and retreated. Many were slaughtered as they ran from the battlefield. Others drowned in the Rhine. Chnodomar was captured. Reports place the German dead at 6000. The Romans only lost 247 men. The Alamanni were driven beyond the Rhine. As a result, Alsace was not ruled as part of Alamannia, but became a disputed territory for more than 1500 years, up to 1945 when its status as French région was settled. 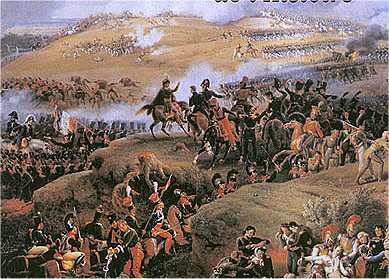 "The Duke of Valmy (for Kellermann, when made one of Napoleon's military peers in 1802, took his title from this same battle-field) had participated, during his long and active career, in the gaining of many a victory far more immediately dazzling than the one the remembrance of which he thus cherished. He had been present at many a scene of carnage, where blood flowed in deluges, compared with which the libations of slaughter poured out at Valmy would have seemed scant and insignificant. But he rightly estimated the paramount importance of the battle with which he thus wished his appellation while living, and his memory after his death, to be identified. The successful resistance which the raw Carmagnole levies and the disorganized relics of the old monarchy's army then opposed to the combined hosts and chosen leaders of Prussia, Austria, and the French refugee noblesse, determined at once and forever the belligerent character of the revolution. 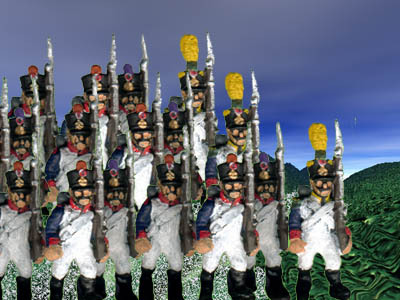 The raw artisans and tradesmen, the clumsy burghers, the base mechanics, and low peasant-churls, as it had been the fashion to term the middle and lower classes in France, found that they could face cannon- balls, pull triggers, and cross bayonets without having been drilled into military machines, and without being officered by scions of noble houses. They awoke to the consciousness of their own instinctive soldiership. They at once acquired confidence in themselves and in each other. and that confidence soon grew into a spirit of unbounded audacity and ambition. " From the cannonade of Valmy may be dated the commencement of that career of victory which carried their armies to Vienna and the Kremlin." 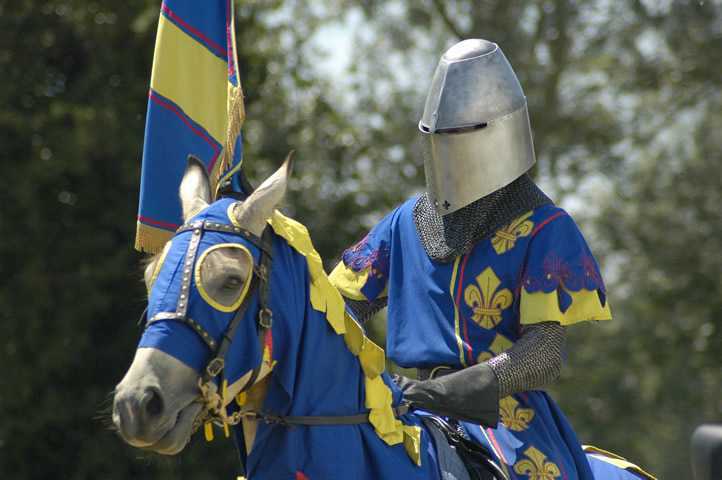 "In the autumn of 1428, the English, who were already masters of all France north of the Loire, prepared their forces for the conquest of the southern provinces, which yet adhered to the cause of the dauphin. The city of Orleans, on the banks of that river, was looked upon as the last stronghold of the French national party. If the English could once obtain possession of it, their victorious progress through the residue of the kingdom seemed free from any serious obstacle. Accordingly, the Earl of Salisbury, one of the bravest and most experienced of the English generals, who had been trained under Henry V., marched to the attack of the all-important city. and, after reducing several places of inferior consequence in the neighborhood, appeared with his army before its walls on the 12th of October, 1428"
"THE broad tract of champaign country which intervenes between the cities of Poitiers and Tours is principally composed of a succession of rich pasture lands, which are traversed and fertilized by the Cher, the Creuse, the Vienne, the Claine, the Indre, and other tributaries of the River Loire. Here and there the ground swells into picturesque eminences and occasionally a belt of forest land, a brown heath, or a clustering series of vineyards breaks the monontony of the widespread meadows ; but the general character of the land is that of a grassy plain, and it seems naturally adapted for the evolutions of numerous armies, especially of those vast bodies of cavalry which principally decided the fate of nations during the centuries that followed the downfall of Rome, and preceded the consolidation of the modern European powers. This region has been signalized by more than one memorable conflict ; but it is principally interesting to the historian by having been the scene of the great victory won by Charles Martel over the Saracens, A.D. 732, which gave a decisive check to the career of Arab conquest in Western Europe, rescued Christendom from Islam, preserved the relics of ancient and the germs of modern civilization, and re-established the old superiority of the Indo-European over the Semitic family of mankind"
"A BROAD expanse of plains, the Campi Catalaunici of the ancients, spreads far and wide around the city of Châlons, in the north east of France. The long rows of poplars, through which the River Marne winds its way, and a few thinly scattered villages, are almost the only objects that vary the monotonous aspect of the greater part of this region. 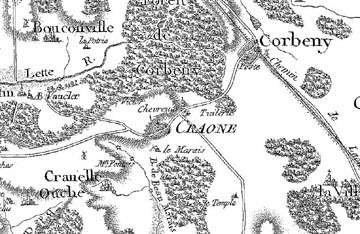 But about five miles from Châlons, near the little hamlets of Chape and Cuperly, the ground is indented and heaped up in ranges of grassy mounds and trenches, which attest the work of man' s hands in ages past, and which, to the practised eye, demonstrate that this quiet spot has once been the fortified position of a huge military host. Local tradition gives to these ancient earth-works the name of Attila' s Camp. Nor is there any reason to question the correctness of the title, or to doubt that behind these very ramparts it was that 1,400 years ago the most powerful heathen king that ever ruled in Europe mustered the remnants of his vast army, which had striven on these plains against the Christian soldiery of Toulouse and Rome. Here it was that Attila prepared to resist to the death his victors in the field ; and here he heaped up the treasures of his camp in one vast pile, which was to be his funeral pyre should his camp be stormed"
1477 AD Charles the Bald Killed - The Battle of Nancy is won by Swiss pikement fighting for Louis XI. 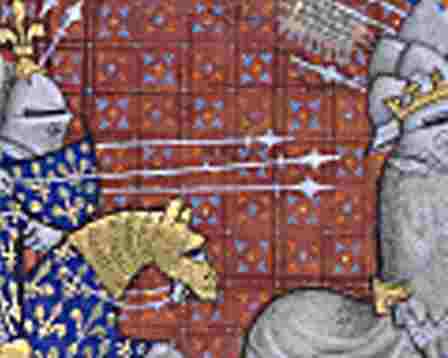 Charles the Bald, the last of the Burgundy claimants to the throne, is killed in the battle. This ends for a while the incessant struggles for the French crown. Bataille de Bléneau Bataille de Saint-Aubin-du-Cormier Bataille de la Roche Derrien. 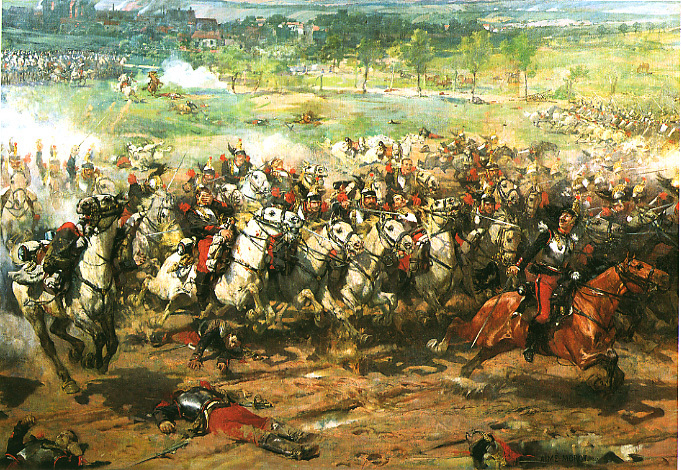 Battle of Verneuil. The Battle of the Sabis, also known as the Battle of the Sambre, was fought in 57 BC between the forces of the Roman Republic and an association of Belgic tribes in Gaul. Julius Caesar, commanding the Roman forces, was surprised and nearly defeated. However, a combination of determined defense, skilled generalship, and the timely arrival of reinforcements allowed the Romans to turn a near- defeat into a crushing victory. Spring 507, between the Franks commanded by Clovis and the Visigoths of Alaric II, the conqueror of Spain. Clovis and Anastasius I of the Byzantine Empire agreed that each would attack the Goths, the Franks crossed the Loire. Clovis himself killed Alaric. The battle forced the Goths to retreat to Sepimania, which they continued to hold. The success at Vouillé allowed the Franks to control the southwestern part of France. Toulouse was taken. Alaric's illegitimate son Gesalic (509-511) tried to regroup at Narbonne, but he was deposed and ultimately killed when Narbonne was temporarily taken by Burgundian allies of the Franks (until 511). The Franks might have pushed farther, if Theodoric the Great had not intervened. Canao defeats the Franks near Vannes c 635 Nominoe defeats Charles the Bald at Ballon near Redon, 22nd November 845 Alan I the Great defeats the Vikings at Questembert 888AD Alan II Barbertorte beat the Vikings at St Brieuc 936, Nantes (a Viking base) 937, and Trans 939, driving them from Brittany. 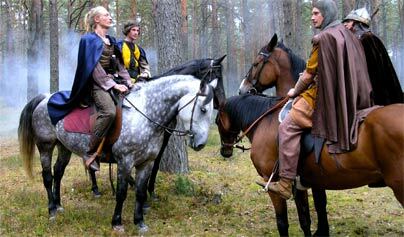 The elusive half-mythical Dark Age figure of Arthur was King or warlord of the Romano-British, and may have fought battles in Gaul as well as Britain. His aliases in history are thought to be Aurthuile, Artorius & Riothamus. 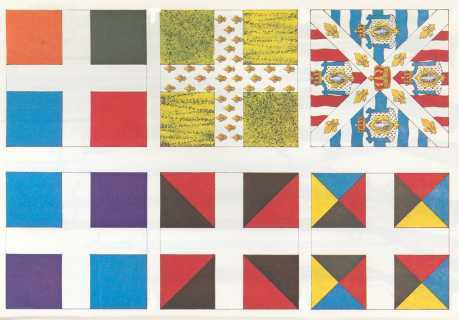 A new book by Anne Curry of Southampton University claims that the English were indeed outnumbered at the battle of Agincourt, but only by a factor of 3:2, as revealed by the recruitment records of both sides. Shakespeare and others created myths around the battle for reasons of English patriotism. ..the victory was gained by Philip Augustus (1180- 1223), backed by a coalition of feudal nobles, over the Emperor Otto IV. This was the first event in French history which called forth a movement of national solidarity around a French king. Louis spent much of his reign riding around the Paris area putting down rebels in the Royal demesne, fighting engagements at Livry, Gournay, Lagny, Montmorency, Luzarches, and Meaux. This was one of the conflicts over inheritances which periodically plagued the Carolingian Empire. Louis the Pious died in 840 with the succession unresolved among his sons: Lothar, Louis, Pepin II and Charles, who had each however been allocated some territory and the noble followings therefrom. They made an appointment to settle the issue by force of arms, on a battlefield in the flat cornfields on the plateau of Fontenoy-en-Puisaye, near Autun in Burgundy (NOT the site of The Battle of Fontenoy 1745, which was fought in Belgium near Tournai). They commenced by saying a Mass and this set the tone for the chivalric battles of the centuries to come. 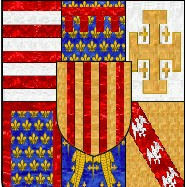 Charles and Louis were, allies, while Lothar was allied with Pepin II. Details of the battle are sketchy. 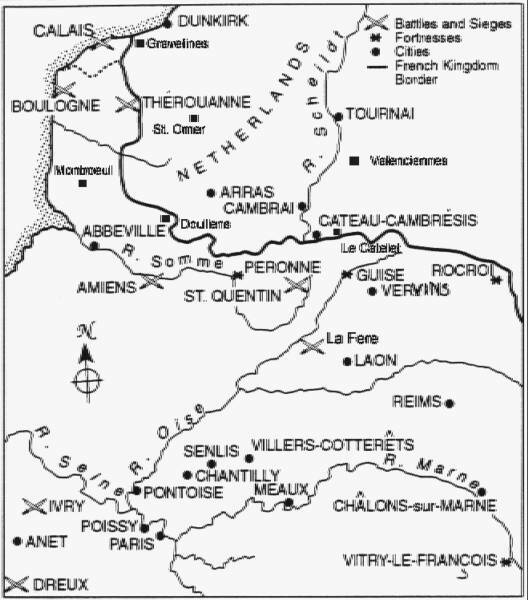 The armies met at Fontenoy on June 21 but fought only on June 25. 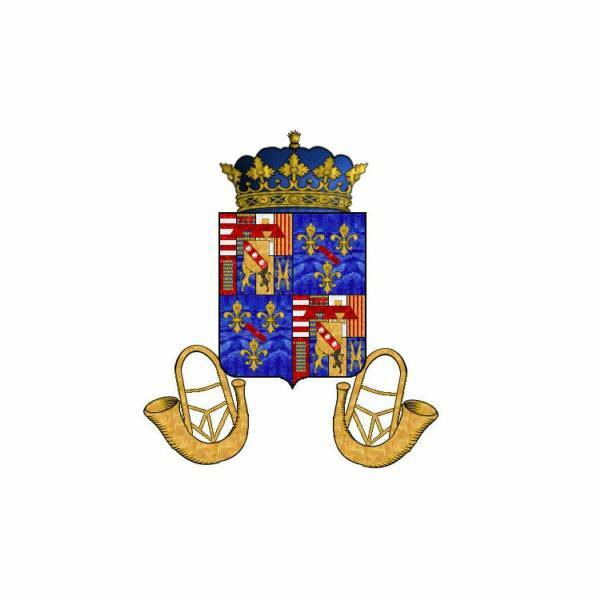 The battle started with Lothar having the upper hand but turned when Count Guerin of Chalon ¿ whose County in Burgundy spanned the River Rhone - entered the conflict on the side of Charles. Lothar continued the fight but the brothers finally came to an agreement on the partition of their father¿s kingdom at Verdun in 843. 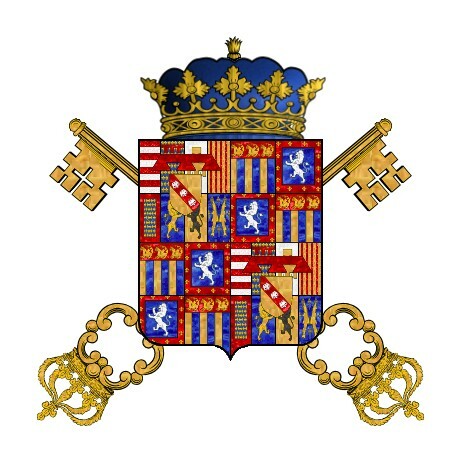 Lothar retained the title of Holy Roman Emperor and received a strip of land extending from the Low countries in the north, down the west side of the Saone/Rhone and into Italy. 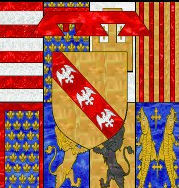 Louis received Bavaria, which later became Germany and Charles received west Francia, which ultimately became France. 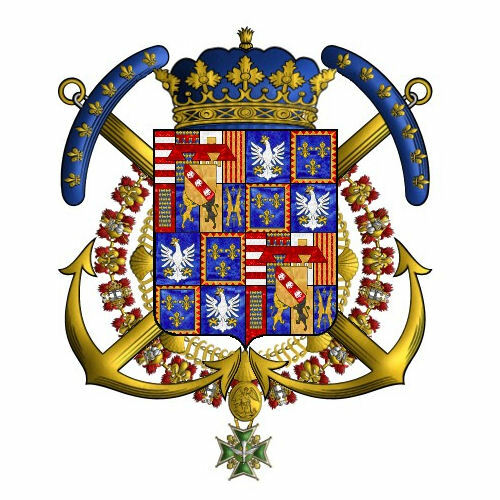 Pepin II, being on the losing side, was cut out of the division. The battle site is marked by a monument and a local museum. 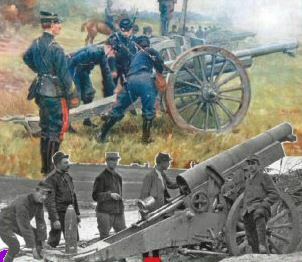 ¿ Battle of the Marne, belleau wood, chateau- thierry, marne river ¿ a World War I battle in northwestern France where the Allies defeated the Germans in 1918 ¿ Chalons, Chalons-sur-Marne ¿ the battle in which Attila the Hun was defeated by the Romans and Visigoths in 451 ¿ Crecy, battle of Crecy ¿ the first decisive battle of the Hundred Years' War; in 1346 the English under Edward III defeated the French under King Philip of Valois ¿ Dunkirk, Dunkerque ¿ a city in northern France on the North Sea where in World War II (1940) 330,000 Allied troops had to be evacuated from the beaches at Dunkirk in a desperate retreat under enemy fire ¿ Ivry, battle of Ivry, Ivry la Bataille ¿ a battle (1590) in which the Huguenots under Henry IV of France defeated the Catholics under the duke of Mayenne ¿ Meuse, Meuse River, Argonne, Argonne Forest, Meuse-Argonne, Meuse-Argonne operation ¿ an American operation in World War I (1918); American troops under Pershing drove back the German armies which were saved only by the Armistice on November 11 ¿ Orleans, siege of Orleans ¿ a long siege by the English was relieved by Joan of Arc in 1429 ¿ Poitiers, battle of Poitiers ¿ the battle in 1356 in which the English under the Black Prince defeated the French ¿ Rocroi, battle of Rocroi ¿ a battle in the Thirty Years' War (1643); the French defeated the Spanish invaders ¿ Saint-Mihiel, St Mihiel, battle of St Mihiel ¿ a battle in the Meuse-Argonne operation in World War I (1918); the battle in which American troops launched their first offensive in France ¿ Soissons, battle of Soissons-Reims, battle of the Chemin-des-Dames, battle of the Aisne ¿ a battle in World War I (May 1918); the Germans tried to attack before the American numbers were too great to defeat; the tactical success of the Germans proved to be a strategic failure ¿ Somme, Somme River, battle of the Somme ¿ battle in World War I (1916) ¿ Somme, Somme River, battle of the Somme ¿ battle of World War II (1944) ¿ Tertry, battle of Tertry ¿ a battle in France in 687 among the descendants of Clovis ¿ Valmy, battle of Valmy ¿ the French defeated the Austrian and Prussian troops in 1792 (with a famous cannonade from the French artillery) ¿ Verdun, battle of Verdun ¿ a battle in World War I (1916); in some of the bloodiest fighting in World War I the German offensive was stopped. Your web site is great. To secure the defence of the English Channel, the Romans created a naval station at the foot of the Gallic settlement of Gesoriacum, the name of which was changed to Bononia Oceanensis (Boulogne-sur- Mer). Here was stationed the ¿Classis Britannica¿, the Channel fleet. Caligula, who honoured it with a visit in the year 40 A.D., ordered the construction of a lighthouse, the twelve storeys of which were each smaller than the one below, and which held a light at the height of two hundred feet. The lighthouse, known as the Turris Ardens, and later as the Tour d'Ordre and the Old Man, lasted until 1644. There were also posts on the other side of the strait, for instance at Richborough where there was a great ceremonial gate, and at Dover, where there still exists a fragment of a Roman lighthouse. This fragment, the Bredenstone, serves as a seat for the Lord Warden of the Cinque Ports at the ceremony of his investiture. In the 5th century the Channel fleet left Boulogne when the invasion of the Franks began. This battle must hold the record for the one known under the most different names!. Attila the Hun, with numerous subject German tribes including Gepids and Ostrogoths, marched on Orleans where he had been secretly promised the assistance of an Alan colony against the Romans. A hastily cemented alliance of Romans under Aetius, and Visigoths under Theoderic, reached the city before the Huns arrived. Attila declined to assault the strongly fortified city and retreated along the road to Troyes (Tricasses). Not very far from Troyes, the Huns turned to face the confederate army which was close upon their heels. The battle, which began in the afternoon and lasted into the night, was drawn; there was immense slaughter, and king Theoderic was among the slain. Next day, the Romans found that Attila was strongly entrenched behind his wagons. Thorismud, son of Theoderic, burning to avenge his father's death, was eager to storm the entrenchment. However Aetius was eager to maintain a balance of power amongst the barbarians, and persuaded Thorismud to return to Tolosa, lest his brothers should contest his succession to the kingship. The battle¿s significance has been exaggerated in conventional history. It cannot be designated as one of the critical battles of the world. The campaign had really been decided by the strategic success of the allies in cutting off Attila from Orleans. The battle was fought when he was in full retreat, and its value lay in damaging his prestige as an invincible conqueror and in weakening his forces. As soon as lord Wellington had the news of the surrender of Pamplona to the Spaniards, he decided to advance into French territory. There followed several combats in the Nivelle and the Nive, in which the allies lost 5,000 men. At Orthez, Soult awaited him with 40,000 soldiers, commanding the right general Reille, the center Drouet, and the left, that rested on the city, defending the passage of the river, in charge of Clausel. Beresford attacked the French right, while general Picton attacked his center and left at the same time. The French were forced backwards by the center, although in good order, and their retirement forced the wings to fall back. 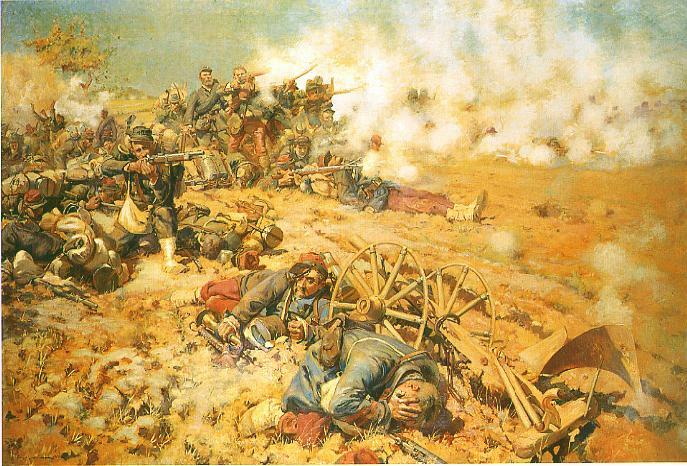 The retreat soon turned to a rout and Marshal Soult lost up to 12,000 men, many of them deserters, and 2,000 prisoners. 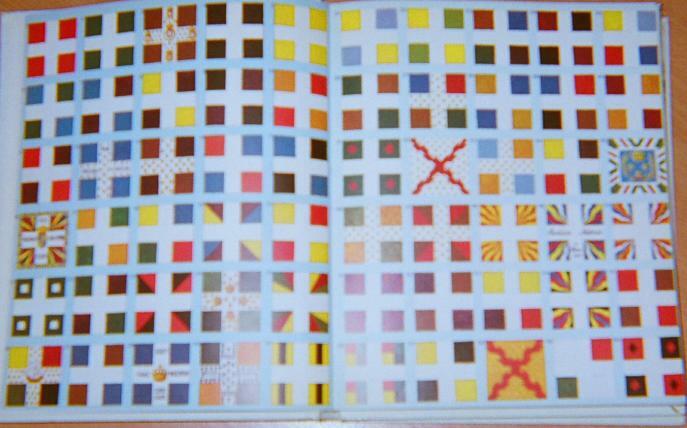 The allies lost 2,300 men, of whom 600 were Portuguese. a v pretty site on this battle against the Cathar heretics in the mountains of southern France near Carcasonne. Two French archaeologists said using carbon dating tests have located the site of Julius Caesar¿s final conquest of the Gauls in 51 BC at the edge of the village of Puy d¿Issolud, north of the town of Cahors, in the Lot region of south-west France. Caesar¿s memoirs name the place as Uxellodunum. A new dig would begin at the site to provide more evidence of this battle site where 20,000 Roman soldiers overcame the 5,000 Gaullic defenders. The Romans laid siege to the village and forced their adversaries into surrender by diverting the sole water source. Legend has it that the Caesar cut off the right hands of his prisoners before his triumphant return to Rome.